It’s been a challenging but exciting two years for Auckland and its new council. We’ve kept everything running while combining eight legacy councils, enjoyed the Rugby World Cup, implemented a new structure with 21 local boards, delivered our 30-year Auckland Plan, created a waste minimisation plan, a 10-year funding plan, a single rates system and more. As an Aucklander, and as deputy mayor, these achievements make me proud. But what makes me even prouder is hearing other Aucklanders talk about the vision for Auckland to become the world’s most liveable city. In just two years, we have gone from a standing start to a vision the majority of Aucklanders already recognise as their own. Now comes the hard part – making the vision a reality, while fronting up to the major issues facing our city. We’ll need 400,000 more homes over the next 30 years: unless we address that, where will our children live? How do we house our growing community in a safe and affordable way? Our economy needs to grow and we need an attractive, business-friendly city creating jobs; unless we address that, where will our children work? To meet these challenges, we need all Aucklanders to get involved. We also need the right tools, and the most important of these will be the Auckland Unitary Plan – the rulebook to set out where and what we can develop and how we protect our environment and heritage. It will ensure we’re not just making space for our city to expand – we cannot simply spread from the Bryndewyns to Pukekohe. We need to make our city more vibrant and a better place to live through well-planned growth. The Unitary Plan will also ensure we can demand much better building design. To be great, our city needs to look great and make the most of our stunning environment and built heritage. Through the Auckland Plan – and together with the 15,000 people who have had their say – we have identified where much of our growth needs to be focused – one city centre, 10 metropolitan centres, 33 town centres and 54 local centres, stretching across the region. Concentrating housing and business development in and around these areas is essential to delivering the “quality compact city” Aucklanders have asked for. This means we get more of what’s essential for true “liveability”. More local shops and community facilities for more people. More affordable homes. More customers for more local businesses. More people closer to more jobs. More choices about where and how we live at different stages of our lives. More of us using local transport and local amenities, which will help our communities thrive and become more resilient to future challenges like increases in fuel costs. In short, it means enabling stronger, livelier neighbourhoods. For proof that people want lively, community-focused areas, ask any estate agent where the demand is. And it’s the same the world over. The current district and regional plans simply don’t cut it for what Auckland needs now – in terms of quality design and sustainable development as well as consistent protection of what we most value. Though each is excellent in parts, many are more than 10 years old. So we are taking the best of those plans and injecting the vision of the Auckland Plan to create a clearer, simpler and consistent Unitary Plan for the whole city-region – a plan to give certainty to residents, businesses, community groups, iwi and developers. We need these new rules urgently, but we also need to ensure we get them right. This is why we’re taking a very different approach to how we usually develop our planning rules. Our focus is on up-front engagement that is designed to be truly inclusive. We’ve engaged with local and regional stakeholders and communities for their input before the draft has even been written, let alone formally signed off. This is completely new for us, and this feedback – coming on top of the expert input we’ve had over the past 18 months – has been very valuable. This feedback will shape the draft, which will be published in March for further informal consultation. This is when we will encourage all Aucklanders to have their say, particularly looking to involve young people, who will inherit this city and make it thrive. We will then process all the feedback, with a proposed plan notified in September 2013 and open for formal submission. In addition, the Government has backed our calls to streamline what happens after notification. Instead of potentially getting bogged down in years of appeals, the Government is putting forward legislation to see the Unitary Plan implemented within three years of next September’s proposed plan. We will have an extended submissions period, with an independent hearings panel to make recommendations back to the council. Where the council and the panel agree, the plan will become operative from that point, subject to appeals to the High Court on points of law. If the council disagrees with the panel on any elements, parties can appeal those points to the Environment Court. This is significant for Auckland. The Government has recognised just how important the plan’s implementation is to the country’s future. 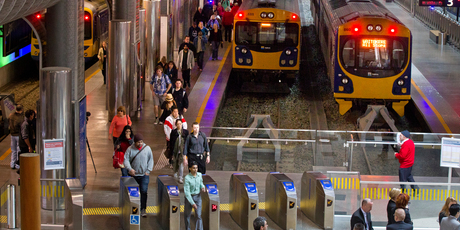 Auckland’s success will drive New Zealand’s success. This new approach can make people nervous. Some even wonder what we’re up to. Do we have some kind of secret agenda? Well, I’m very happy to come clean about that agenda … it’s to continue to make Auckland a better city for everyone and we want to do this in partnership with the people of Auckland. This is the vision driving our political leadership across the governing body and local boards, it drives the council’s dedicated staff, and it drives me. We are committed to doing what is right for Auckland – we all live here and we are passionate about our city. It’s one of the main things that gives me real confidence about where Auckland is heading. And confidence that, remarkable as the last two years have been, the years to come will be better still.